When you think of Arizona, you usually think of one thing: sunshine…and lots of it. Arizona is sunny at least 85% of the time. You’d think with that much sunshine, Arizona would be the world leader in solar energy research. You’d think that when flying into Phoenix’s Sky Harbor airport, you’d see in addition to all the backyard pools, you’d see solar panels on every roof. 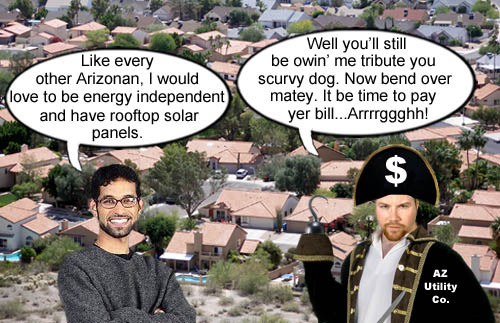 You’d think that Arizona’s electric utility companies would be making roof top solar energy affordable to everyone and solar energy companies would be making money hand over fist. Well, in this state, you’d be WRONG, WRONG, WRONG!!! First of all the cost of rooftop solar is so high($11,000 to rent, 20-30k to buy) that most people just can’t afford it. This is even despite the fact that an overwhelming number of Arizonans are interested in solar(94% according to the above article). Being energy independent is right in line with Arizona’s independent spirit. So with the demand so high, why isn’t the solar industry exploding? Enter the monopolistic Arizona electric utility companies. APS and SRP are the power utility companies which provide power to the Phoenix metropolitan area. They’ve spent millions on building solar arrays in the desert, like SRP’s huge array by Gila Bend, which is terrific for using clean energy. And both companies are always advertising to ‘Go Solar’. But it’s all very disingenuous. We’ve mentioned the high costs. But the rate plans, like SRPs, are something we’d expect from pirates. The whole idea is to be energy independent with rooftop solar; to get off the grid. But with the rate plans in place, you’d still have to pay a steep monthly fee, which kind of defeats the purpose of having solar panels. Like the article in the link says, SRP is saying, “You can use solar power… but only if you buy it from us, and don’t generate it yourself.” But we really shouldn’t be surprised by this, since this state is controlled by anti-environmental, conservative Republicans and they pull this kind of crap all the time in this state. 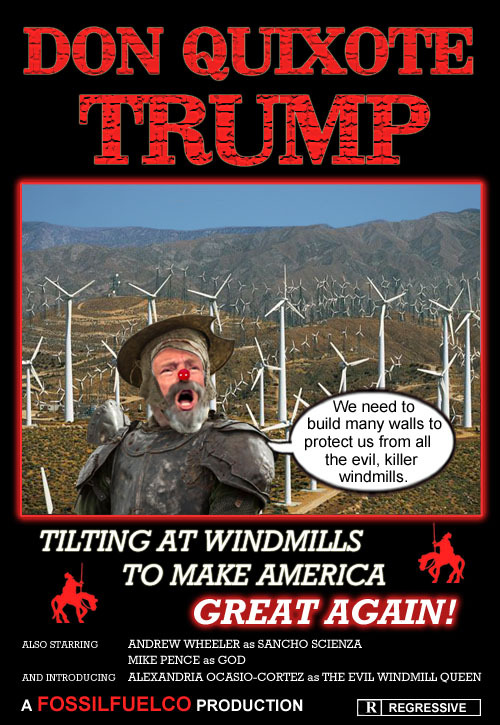 We think that SRP and APS employees should just don pirate uniforms and quit trying to con people into thinking they’re so pro-solar, when all their rate plans and prices make it impossible for normal everyday people to supply their own electricity and be energy independent. Simply put, here’s a slogan which sums up perfectly how we feel: Support Rooftop Solar – Power to the People! An Arizona electric utility company official explains to a naive, energy independent minded consumer how solar energy really works in the state of Arizona. Arrrrggghh!